Description A 2-1/2" pewter fob engraved "Beresford"
Photo: Larry Johnson, courtesy of The CFA Foundation, Inc. The Beresford Cat Club of America, Inc. was formed in Chicago in 1899 and quickly rose to prominence. The club was named after noted British breeder Lady Marcus Beresford, who had founded 'The Cat Club' registry in England in 1898. 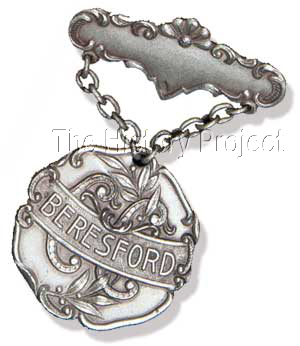 Beresford held its first show in January, 1900, reportedly awarding 176 prizes1, possibly such as the undated fob shown here. Beresford Cat Club was one of the first organizations in North America to record litters and provide registration for pedigreed cats. They published their data in a series of four Stud-Book and Registry of the Beresford Cat Club; the first, in 1900, covered registrations from July 1899 until July 1900. There are 246 entries in the first issue, 241 Persians and five shorthairs - two Russians, one Siamese, and two domestics of unknown parentage1. The clubs final studbook was published in 1906, and contains registrations from July 1903 through July 1905. The Beresford Cat Club, in its registering capacity, ceased to exist in 1906. Former club members created a group that became the American Cat Association (ACA).